An Emperor is a sovereign ruler of an empire, and lesser known but still true, an Orange and brown North American butterfly that really likes blackberries. So, does the Lucky Emperor Casino review live up to the ruler, or does it just like to spend time amongst the blackberries? 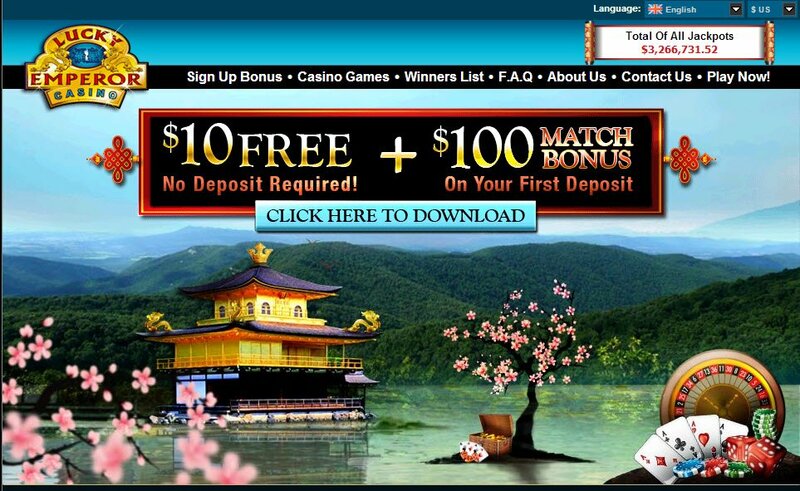 As an established member of the Casino Rewards group, Lucky Emperor Casino is off to a good start. However, despite being licensed in the Canadian province of Kahnawake, under North American jurisdiction, US players aren't allowed to play at Lucky Emperor Casino. 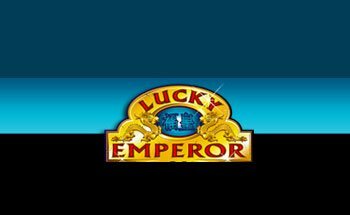 Lucky Emperor Casino download is simple and takes no time at all. There is also a flash based version for instant play in your browser, but it was slightly hidden amongst the More Information links right at the bottom of their website so took a bit of finding! It gives you the same type of lobby you get in the downloaded version, complete with different tabs, neatly showing Progressives, Table Games, Slots and the ever elusive and mysterious Others. The layout and busyness of the downloaded version lobby meant that I was very pleased to find the flash version and ended up playing in my browser, despite usually preferring the downloaded versions of online casinos. It's lucky for the Lucky Emperor Casino that they have Microgaming games, in addition to a stunningly themed Japanese style casino. Microgaming's speciality is its huge variety of slots and that means only good things for the Lucky Emperor Casino players who get to enjoy Agent Jane Blonde slot, Thunderstruck II slot, and a whole host of Lucky Emperor Casino Microgaming jackpot slots. Let's not forget the ever popular Tomb Raider - Secret of the Sword and Atlantic City Blackjack GOLD either. For those other Brits out there who like the old style fruit machines from back in the day, you can enjoy AWP slot games, and they will take you back to your childhood years spent playing on those old school slot machines. Test your skill, not just your luck with something a little bit different. 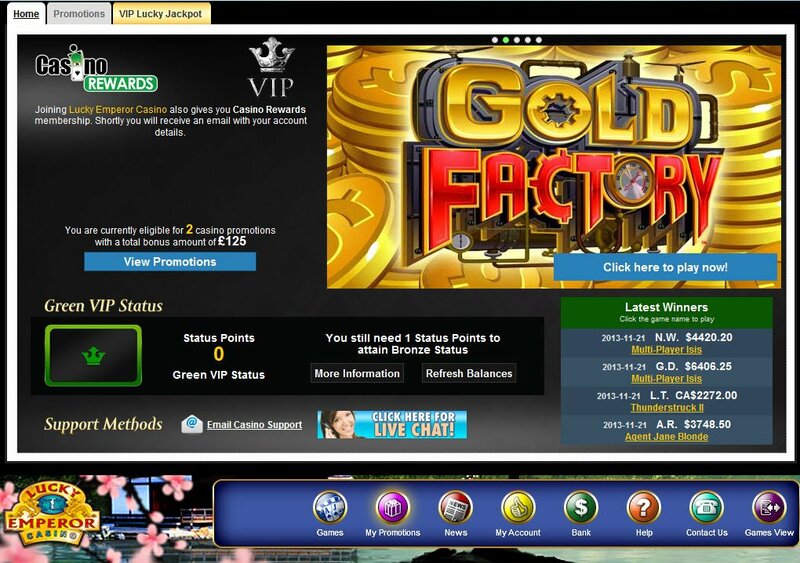 Lucky Emperor Casino offers are updated regularly, and they state they want to offer you the best promotions around. As a Casino Rewards casino, one of the most successful gaming loyalty programmes online, they certainly do care about giving you the best rewards. Firstly, you'll get £10 free, just for signing up. As soon as you deposit to Lucky Emperor Casino, they'll match up to $100 - there's $110 of casino bonuses to play with straight off. Within a day of being signed up, I was eligible for $363 in bonuses. In addition to the sign up bonus, I was offered a 15% match bonus on another deposit of £50 or more, up to $200. Then there was the monthly promotion with double points being offered on the 243-Rell Thunderstruck II Slot. Last but not least was the tempting Octopays offer, with $/£100 free for the Top 5 Wagerers, in a special deal for this week only. All the various payment methods are in the line-up for this lucky casino, including Neteller, Skrill, Paysafe and Trustly. Customer service is 24/7 and there is an international number to call which unfortunately isn’t free, like the local UK, Canadian, Danish and German Freephone numbers. There is an email address, but I always prefer to use instant Live Chat where possible, as I must admit I am quite impatient when it comes to my casino questions!